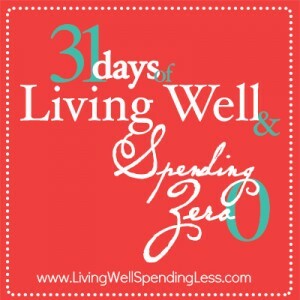 This is the second day of my 31 Days of Living Well & Spending Zero challenge. To read all the posts in order, start with Day One or visit the Overview Page. I should probably warn you from the start: we are going to be doing a lot of cleaning, organizing, & inventory-ing this month! (I never said it was going to be easy!) One of our main goals for the month is to get into the habit of using what we have, rather than buying more. Another goal is to realize and appreciate all that we DO have, which is easier to do when our things are cleaned, organized, & inventoried. Sometimes all you need is a fresh look. We will be starting off our challenge for the next few days by planning our food strategy. I don’t know about you, but the second I start to think about trying to cook with only the food in my pantry & freezer for a whole month, I start to panic. My brain shuts down and although my cupboards may in fact be brimming, all I see is “NOTHING TO EAT.” Worse, I have found that it is when I am hungry that I make my worst financial decisions. I am willing to spend more when I just want to get food in my belly as quickly as possible! Today we are going to start by taking stock of exactly what we have on hand. If you are a coupon user or stockpiler, you probably have more than a few forgotten packages back in the nether-regions of your shelves. It’s time to take control. Take out all the food from your pantry cupboard(s). As you remove it, put like items together. Be sure to put all OPEN items in a separate section. As you go, toss any items are no longer edible. 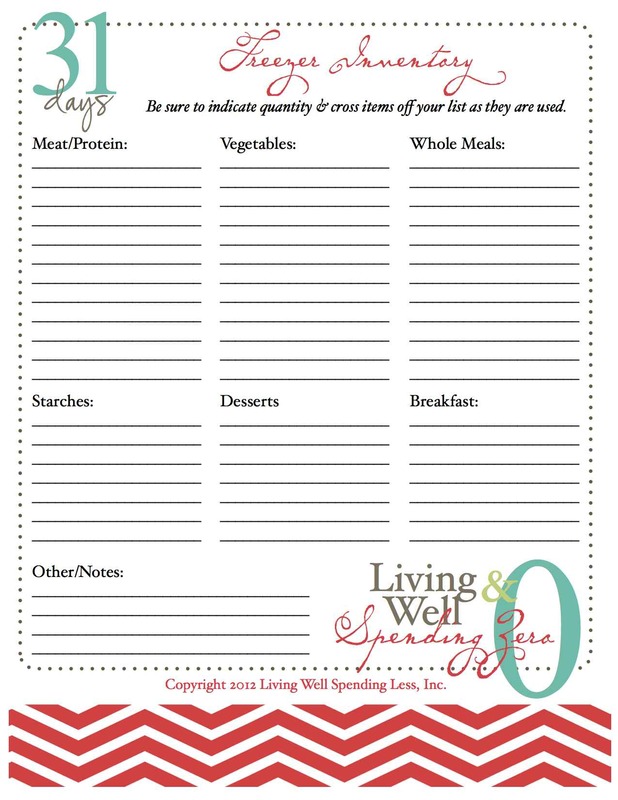 Use this pantry inventory worksheet to write down everything you have, going section by section though the different types of items. Place items neatly back in pantry once you’ve inventoried that section. Be sure to put open items that you are currently using in a separate cupboard or on a separate shelf. Make a rule to not open a new package until the old one is finished! Repeat this process for your freezer. When was the last time you cleaned out your pantry? Were you surprised by how much food you did or didn’t have? In what way? Ha – I must have known this was a necessity, because I did it last night! I was so proud this morning when I opened the cabinets and saw everything so organized. Doing this one day at a time with you makes it seem almost possible to spend nothing this month! You should have seen the looks that Husband and the littles gave me last night when I told them that we would only be eating from our pantry and freezer this month. It was hilarious!! OMG I so totally told myself last night while making dinner I needed to get my cabinets in order to start making a grocery list for my next month shopping! (I shop by a month at a time). This will be so handy and perfect to use. Thanks! Can’t wait to see what the next few days bring! 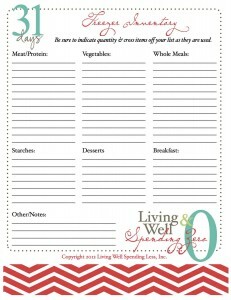 Thank you for sharing the free printables. I’ve always been very organized where the pantry is concerned but using an inventory list will make it even easier. You’re welcome! I’m glad you like them! I am sadly not joining this month. Due to 5 kids, 1 income I will be doing plenty of Holiday shopping this month. I do plan to save some money this month and not buy the stuff we don’t really need. But watch out come January I will be going back and completing this challenge then. I wish you all luck. Ditto what Melissa says. 6 kids and 1 income, we are opting to do this challenge in January as well. My family just started the Dave Ramsey Financial Peace classes this month, and since step 1 is to build your emergency fund FAST, this month long spending freeze comes at the perfect time! 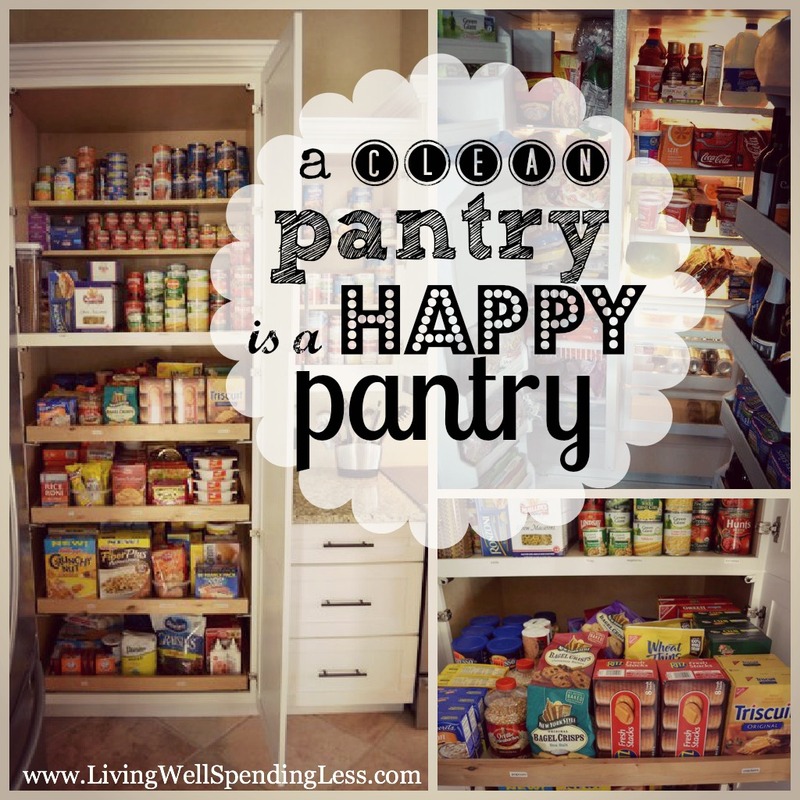 I have to admit to a small amount of “pantry envy” tho – seeing your stockpile (when I’ve taken a “break” from couponing the past few months) makes me wanna run out and restock lol. Between you and Dave I hope to be in better financial shape at the end of the month ;). These are some really great tips!!! So true about making sure your counters are clear … so much to clean out. Great idea for a series. So many useful things to learn!! I am just now finding this website and all the fun goodies that are in it. I am not able to take part in this 30 days yet because of personal things. However, I have set a goal to get those resolved and do this for the month of May. I am not going to read to far ahead but have saved the first page and marked my schedule. Now, I just have to break the news to my boys…. I have a confession. I have a cleaning lady that helps me twice a month & the pantry is cleaned. However, I will be taking inventory & cleaning out my freezer. Less is more! My Husband and I started cleaning out a few weeks ago. Feeling better already but so much more to get done. We also decided to not buy any food except fruits, veggies and dairy products, after three weeks I had and extra $200 dollars leftover. What an awesome feeling. I also can kind of see what’s left in my freezer another couple of weeks and I shall be on my way to a organized freezer. Thank you for this blog post. I just found your blog today. As I was looking for more tips to help us get our house under control and plan for our debt free retirement in 5 years. And your tips will help alot. 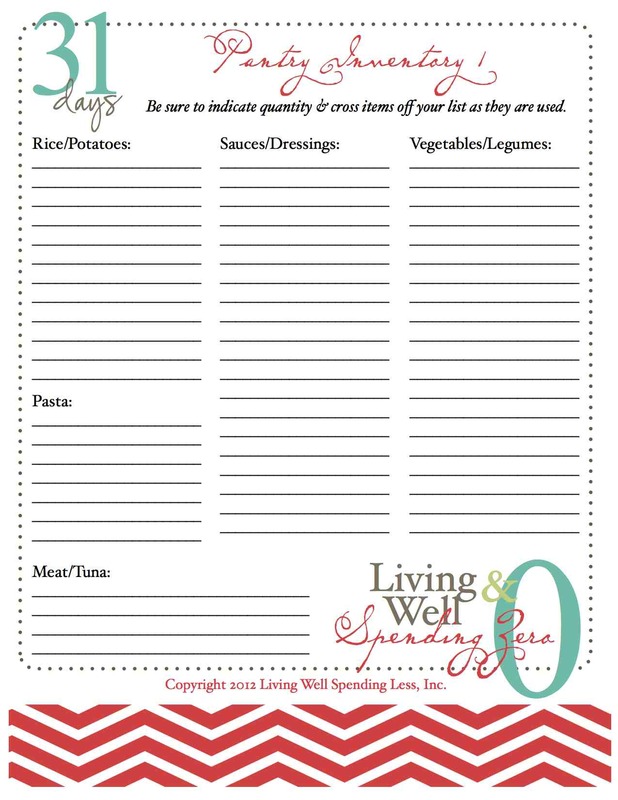 I have saved your Food Pantry and Freezer list and plan to put them in 8.5 x 11 picture frames so that the glass now becomes a dry erase board so I can alter quantities as I use or add them. 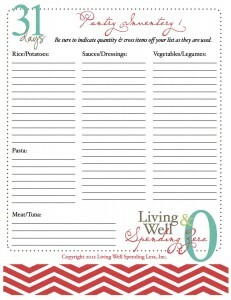 Do you have a list for Spices, Baking, Condiments. I would really love one to match the other two? Decided to give this a go. b) our 2 of our 3 teens live with their Mum half time & she is notorious for just buying things because it’s the start of the school year.- Doesn’t everyone one just need new shoes, socks, lunch boxes, pencils, binder books etc, every year, even thought they still have perfectly good ones from last year? And we have to foot half the bill. And she goes to the most expensive place, because you can get it in one go, where as I’ll shop around for the best prices. Saved $100 on the school book list for our oldest who is with us 100%. It’s 44C/111F today & I just cleared out & did stock take of the fridge & pantry – any excuse to open the fridge again! We’re pretty good, as we DIYed the kitchen last year & I opted for a small pantry so we didn’t over purchase. Just 5 small double ups because something got pushed to the back corner. Also very proud of myself, I haven’t been to the January sales this year & instead am supplementing my wardrobe by making new clothes using fabric, patterns & haberdashery from my huge stash – I’m a costume designer so I have a garage full of stock that I pick up cheaply at business closeouts, massive sales or markets. I rarely buy full price. Also selling heaps on Ebay from my vintage clothing & costumes to supplement my income as I’m not working on a show first 3 months this year. Lets see how this pans out….. I found a whole cake in my freezer! and I found banana bread I had forgotten about. I was worried about cooking out of my pantry but after this I am more comfortable. I am so excited to start this challenge! I recently had some of my hours cut at work, so I definitely could use this challenge to better myself! We don’t have a pantry. We have one shelf in a cupboard (one of those short thin ones) it has the staples. Some cans a box of teething cookies and true butter dish. I do have alot of stuff but I know about all of it. My cupboards are pretty organized. But I need to start eating them or they will go bad. One of the problems I have is that I figured I shouldn’t eat gluten or much of starchy foods at all so there is plenty of that stuff still there which will only be used slowly since of the limited amount I can eat. I really want it to be gone so I can only have stuff I can actually eat on a regular basis. Since I do live in Switzerland where food and cleaning items etc are really expensive I need to have a huge stock which I buy on my monthly trips to Germany (so much cheaper) so I’ll never be that girl with only one bottle of bodylotion in her cupboard. I organized my pantry and freezer and planned meals all in the same day since all the ingredients were fresh in my mind. I was surprised how many meals I had with such little amounts of food. Granted, my chicken spaghetti and fried rice weren’t quite like my usual recipes, but they were still good. Gonna try Princess and trouble’s everything cookies today. Hope my kids love them as much as yours do! is there some where to print all the print outs at once?